The Deputy Minister of Information and Communications Theo Nicol and a high power delegation have returned home, after successfully participating at the 12th ECOWAS Telecom/ICT Ministerial Meeting Preceded by Experts’ Meeting at the Kairaba Beach Hotel in Banjul The Gambia. The main purpose of the meeting was to consider the report of the meeting of Experts, adopt some of its conclusions and make recommendations for the proper conduct of Telecommunications/ICT activities in the ECOWAS region. Among those that were considered are- the implementation status of the ECOWAS 2011-2015 Strategy Document on Priority projects, Resolution A/04/7/95 on 50% Special Reduced Rates for telecommunications services on ECOWAS day, May 28 within ECOWAS, terminating taxes on incoming calls between ECOWAS Member States, Surcharge on International incoming calls (SIIT), access of landlocked countries to submarine cables, The Digital Terrestrial Television (DTT) transmission and compression standards and guidelines on minimum requirements for DTT receivers in the ECOWAS region and the draft ECOWAS DTT technical transition roadmap. Also, to duly consider and allow the West African Postal Conference (WAPCO) and the dot.Africa (.Africa) project to present the status of the implementation of their activities. The meeting which was security tight and given high priority by the Gambia government was opened by the Vice President of The Gambia and Minister of Women’s Affairs, Ajara Dr. Isatou Njie Saidy and welcome statements were made by the ECOWAS Commissioner for Infrastructure Mr. Ebrima Njie and Mr. Nana Grey Johnson, Gambian Minister of Information, Communication and Infrastructure. Over 80 International Experts were also invited. According to Mr. Nana Grey Johnson, the telecommunication sector is constantly experiencing technological developments which require Member States to re-invent their policies and adapt the legal and regulatory framework to these developments. He commended the efforts made by ECOWAS to promote connectivity among Member States with a view of reducing communication charges and welcomed ECOWAS initiative to set the deadline for digital transition to December 31st 2014 and ensure harmonization of DTT transmission standards and technical requirements. 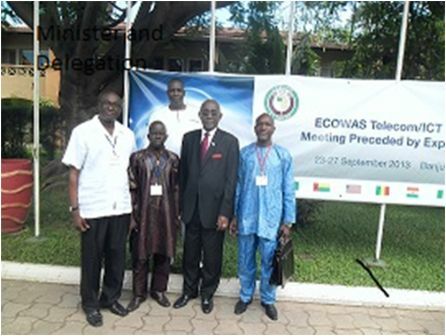 As part of the draft report Member States were urged to commemorate May 28th the day ECOWAS was established by requesting telecommunications operators to offer a 50% reduction on all telecommunications services within the region on that day. Ministers approved in principle the reduction and agreed to take the necessary steps to ensure its implementation. Also in order to comply with the deadline scheduled for June 17TH 2015 for the suspension of Analogue television for the UHF band through the 2006 Geneva Agreement and enable ECOWAS Member States take the appropriate measures to comply with the deadline, the Experts recommended December 31st 2014 as the deadline for digital transition in the ECOWAS region. The Ministers duly adopted this. Further- more, also discussed and agreed in consensus were to facilitate the revitalization of the postal sector in the ICT era. The West African Postal Conference (WAPCO) was established on April 13th by Ministers of Post. In order to enable WAPCO, operate and attain its assigned objectives it was resolved that they needed to receive annual financial support from ECOWAS Commission, be established as a specialized Agency of ECOWAS and that Member States should pay their annual contributions regularly and on time and that the necessary resources were urged by Member States to be provided in order for the postal sector to be able to development at national level. With regards the top level domain name ( dot.Africa) or (.Africa) proposed for Africa as a platform which facilitates innovation and promotes African Companies, people, and culture in view of ensuring the socio- economic development of the continent, INIFORM- ZACR, the technical operator of dotAfrica urged ECOWAS Members to established their list or reserved names and submit them to INIFORM-ZACR and appoint the national focal point in charge of submitting the national reserved names into the online portal. In one of his several meaningful contributions as one of the Ministers of Telecom/ICT with regards service providers to give a 50% discount on all calls within the ECOWAS region on ECOWAS day, Theo Nicol said “The issue of 50% reduction on all calls within the ECOWAS region on every May 28th as ECOWAS day should not be taken as anything big. I believe the private sector in most of our countries will abide by that. In my country for example these service providers often gives out millions of leones especially in promotions and other related issues. In fact, am of the strong opinion that we should also extend it to all local and ECOWAS Member States. Doing so for community course is nothing too big and I therefore strongly support the ECOWAS to endorse it” (round of applauds received). The meeting laid emphasis on activities relating to the development of the internet, content, the postal sector and human resource capacity building for the Department of Telecommunications and Information Technology of the ECOWAS. Participants commended the ECOWAS Commission for the Significant progress made in implementing the Strategic plan and urged the Commission to sustain its efforts to ensure that all the strategic areas , including those relating to the postal sector, are effectively implemented. The meeting commended His Excellency Sheikh Professor Alhaji Dr. Yahya A J J Jammeh, President of The Gambia and the government and people of The Gambia for hosting the meeting. In attendance at the meeting were – Prof. Jean Koulidiati, Minister for the Development of Digital Economy, Development Posts of Burkina Faso, Mr. Bruno Nabagné Kone, Minister of Post and Information and Spokes Person government of Coté d’Ivoire, Mr. Nana Grey Johnson Information and Communications and Infrastructure Minister of The Gambia, Mr. Jean Marie Idrissa Sangare, Minister of Communications and New Information Technologies of Mali, Mr. Cheikh Mamadou Abiboulaye Dieye Minister of Communications and Digital Economy of Senegal, Mr. Theo Nicol Deputy Minister of Information and Communications of Sierra leone, Hon. Mrs. Esther John Audu, ORG Ambassador of Nigeria, Dr. Soumah Fode, Permanent Secretary of the Ministry of Telecommunications of Guinea. Also where the Deputy Minister for Technical Services of Liberia, Mr. Chaibou Aboubakar, SecretaryGeneral of the Ministry of Post and Telecommunications and Digital Economy of Niger, Mr. Christian de Souza Technical Advisor on Media of Benin, Mr. David Gomes President of the National Communication Agency of Cape Verde, Mr. Issah Yahaya representing the Minister of Communications of Ghana and Dr. Fernando Joaquim Fereira de Lacerda. Experts in the Telecommunications/ ICT and Audio- Visual sectors of the Members states listed below are –Benin, Burkina Faso, Cape Verde, Cote d’ Ivoire, The Gambia, Ghana, Guinea, Guinea- Bissau, Liberia, Mali, Niger, Nigeria, Senegal, Sierra Leone and Togo. Members of the Sierra Leone delegation included- Lawyer Musa Nru Kamara from NATCOM, Chairman Idrissa Yillah and Managing Director Mohamed Sheriff from the Sierra Leone Cable Company (SLACAD) and Mr. Gilbert Cooper Secretary in the Ministry of Information and Communications. CAN PRESIDENT BIO AFFORD MORE BAD NAME IN THE U.S AND THE INTERNATIONAL COMMUNITY ? Who owns jeep used for alleged ritual murder attempt ?